adeptly advise, represent, prepare taxes for, audit, and analyze financial information for an impressive array of individuals, corporations, state and government entities, and not-for-profit clients. As accounting professionals, their clients rely on them and their extensive knowledge of tax law, government regulations and bookkeeping to ensure effective compliance with the complicated and ever-changing tax laws. Prepares tax returns, making sure they are filed accurately and on time. Does independent audits of government agencies, such as public schools and municipalities, to make sure their financial activities and documentation comply with state and federal laws, and there are no errors, misinformation, fraud, or overspending. Prepares reviewed or compiled financial statements, based on the needs of the client. Analyzes clients’ financial information, and gives ethical advice. Keeps current with continuous changes in tax laws. Represents clients before the Internal Revenue Service. 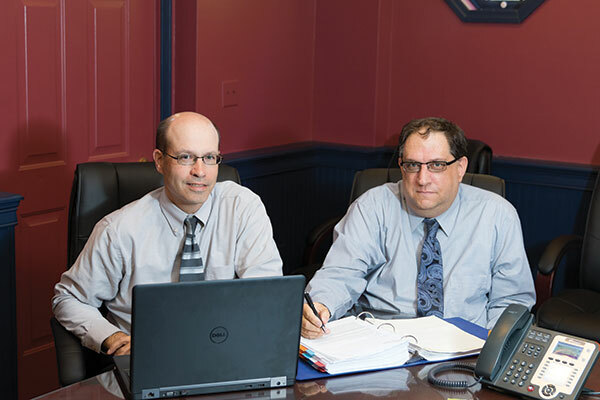 By working with clients on a case-by-case basis to help them structure their tax planning, Boulrice and Wood take the time to carefully analyze each client’s financial situation before they offer advice. Most importantly, CPAs listen carefully to their clients to determine their financial needs, and assist them in keeping and completing the proper documentation to ensure their taxes get filed accurately and on time. In addition, CPAs work as independent auditors for corporations, not-for-profit groups, and government agencies. Although Michael Boulrice and Stephen Wood both grew up in the North Country and earned Accounting degrees from SUNY Plattsburgh, they did not meet until they “ran across each other” at the certification classes all CPAs attend. (Each year they must complete a minimum of 40 professional development hours to maintain their certification.) “I was already in business and my partner, Jack Conroy, was retiring. I needed someone of a similar age to grow the business with,” said Boulrice. While each partner handles his own list of clients, Boulrice and Wood frequently use each other as a sounding board. “A second opinion is always very helpful,” said Boulrice. To assist in this work, they employ three full- time staff: two accountants (recent graduates of SUNY Plattsburgh) and a paraprofessional. They credit Wood’s mentor, Dr. Mohamed Gaber, chair of the Accounting Department at SUNY Plattsburgh, with helping them recruit qualified individuals who share their vision and work ethic. “He sends us good candidates,” confirmed Wood. Constant changes in tax law and enhancements in communications technology mean Boulrice and Wood are always learning. “There’s something new every year. For example, the Affordable Care Act brought significant changes over the last three years,” said Boulrice. Due to their location near the international border, Boulrice and Wood have Canadian clients who need to file U.S. tax returns, and American clients living in Canada who must do the same. The internet helps communication across the border, as well as within the local area, go swiftly and seamlessly. In addition, all taxes are filed online. While there may be some overtime during tax season, the partners strive keep it in balance with their family obligations. For the most part, work is kept even and steady with flexibility for themselves and their employees. “We try to be flexible with our employees and ourselves with demands for time. We make it work,” said Wood. According to the U.S. Department of Labor Statistics, the job market for Certified Public Accountants (CPAs) is projected to grow 11 percent from 2014 to 2024—faster than average for all occupations. Like any industry, employment growth is tied to the health of the overall economy. And, with the economy of the North Country developing momentum, this means the outlook for CPAs, and Boulrice and Wood, is promising.